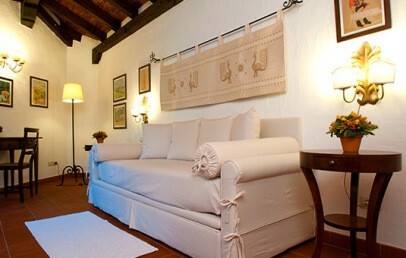 furnishings in the Sardinian style and with the care that the staff reserves to their guests. Suggested to beach lovers who seek also privacy and relax. Located in the touristic village of Pula and not to far away from the nice beaches of the south-west coast of Sardinia, from Santa Margherita di Pula to Chia until Capo Spartivento. 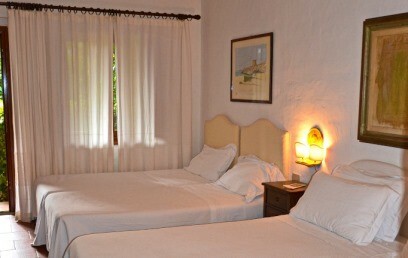 The hotel is good reachable from Cagliari and its airport, with a distance of about 40 km. Designed in Mediterranean style, the Nora Club Hotel & Spa, welcomes its guests in a cosy and warm atmosphere. Open all year around, the property is surrounded by a lush garden of local vegetation, enriched by beautiful exotic plants. The Nora Club Hotel & Spa has double rooms Standard, Deluxe (located on the upper floor with terrace), Junior Suite and Junior Suite Deluxe embedded well-kept and green garden and are furnished in the typical Sardinian style that characterizes also the entire hotel. All rooms have air conditioning, minibar, safe, television LCD with satellite channels, kettle for coffee/tea, shower, hairdryer and complimentary wireless internet connection. The Nora Club Wellness area offers a variety of treatments, massages and well-being programs, not only for the care of your body, but also to recharge your batteries and relax your mind during an active summer holiday or a winter short break. Overlooking the lush garden and offering a Whirlpool, a traditional Turkish bath, a gym with Technogym equipment and relaxing area. The property has a rich breakfast buffet. It has no restaurant service, but on request are cold plates and tasty snacks available from 12 noon until 9 pm. The guests can enjoy the greenery and quiet of nature in which the hotel is embedded, which offers some relax areas and a small swimming pool with whirlpool corner. Moreover at guests disposal, the hotel has a private parking area at the inside of the hotel area. Tourist tax – the municipality of Pula requires the payment of € 2,00 per person/overnight valid from April to October and to be paid on spot. Children under 12 years, disabled people and their assistants, business travelers and students are exempted. The double rooms are located on the ground floor; simple and elegant, decorated in the warm and welcoming style typical for the island. The private bath room possess a shower. 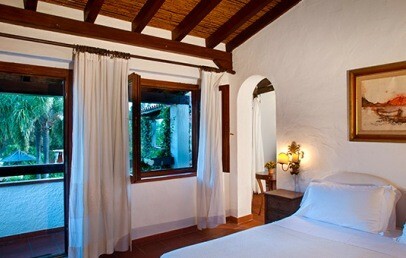 Standard rooms face the lush and refreshing garden that surrounds the hotel. The double rooms are located on the upper floors of the hotel; simple and elegant, decorated in the warm and welcoming style typical for the island. The private bath room possess a shower. 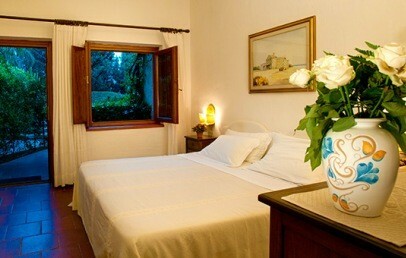 As stated by the name, these rooms have a terrace, with garden view. The open space Suites are located on the upper floors of the hotel; simple and elegant, decorated in the warm and welcoming style typical for the island. 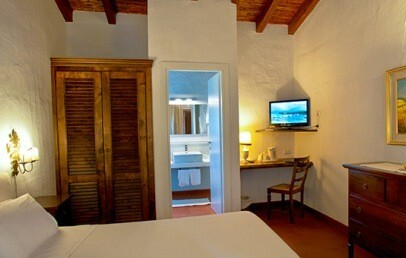 The rooms consist of a double bed and a sitting are with a sofa bed. The private bath room possess a shower. Junior Suites furthermore have a balcony with garden view. Exclusive open space suite located on the first floor of the hotel. It is simple and elegant, decorated in the warm and welcoming style typical for the island. The junior suite consists of a double bed and a communicating sitting area with a sofa bed by an arched opening. The en-suite bathroom has a shower. The Junior Suite Deluxe has an independent entrance and faces a terrace with lounge corner and garden view. Book 3 nights and the last night is free! Book 7 nights and the last night is free! Only for Charming customers: an aperitif at the bar, daily entry to the SPA and use of bicycles for short tours in the village!